Zinski Art set 34 PaperArtsy A5 stamp set ZA34 - Stampers Grove is a webshop and mobile craft shop. Zinski Art Set 34 (A5 set, trimmed, on EZ). 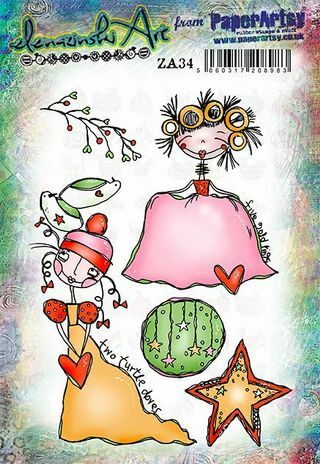 These stamps are designed exclusively for PaperArtsy by Elenazinski Art, of London. All PaperArtsy?stamps are deeply etched red rubber stamps. Each stamp is individually trimmed and presented on EZ mount cling foam ready for use with acrylic blocks. The gorgeous Christmas stamps of Elena's were released late August 2018. Elena's Stamps are A5, trimmed onto cling foam 5 inch x 6.5 inch (13cm x 16.5cm).